Banyuwangi Regency on southeastern tip of East Java province is one of the largest regencies in Java. Formerly known as Blambangan, it is often skipped by travellers heading to Bali by ferry. The capital town or city of the regency is also named Banyuwangi. We visited Banyuwangi several years ago and recently returned to stay at one of the newest and best 4-star hotel here. While the hotel offers comfort and convenience, what else is there to do here? Banyuwangi is slowly rising to become an attraction so be one of the first few to discover it. Travellers coming from Malaysia can now fly direct to Banyuwangi within 3 hours! 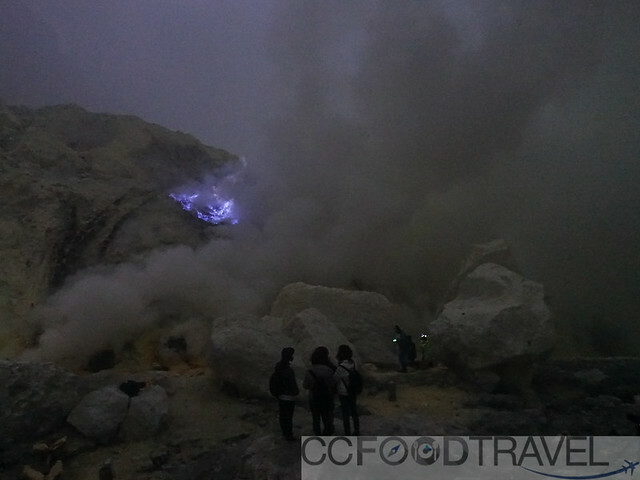 In Banyuwangi Regency in East Java, Kawah Ijen (pronounced ee-jern) claims 2 world records. One, having the largest and maybe the tallest blue flames in the world. Second, having the largest and most acidic lake in the world. Earlier this year, Ijen had been added to UNESCO’s World Network of Biosphere Reserves. Bike and Hike to Kawah Ijen are probably the most famous attractions in Banyuwangi Regency. There are numerous mapped and unmapped trails which take you uphill, downhill jungles, and passing villages and plantations. Don’t want to mountain bike or trudge up jungle trails then organize a 4wd to get up the entrance of the crater. 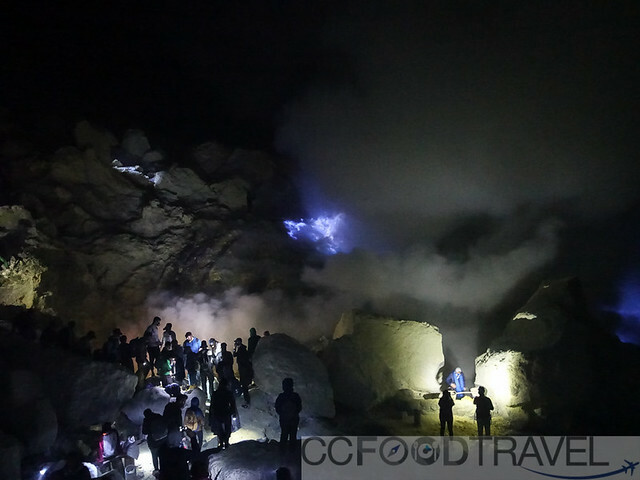 Best time to visit Ijen Crater is April to October – off the rainy season. There are a few places in this world, where you can see blue flames bursting out of the earth’s crust. And most of these rare but awe-inspiring appearances occur at active volcanic sites. And it wasn’t till recently, that we’d checked off this bucketlist destination, from our list, when we were flown in from Bali to Banyuwangi’s small airport, after our beach holiday on the Gili Islands. If you had studied chemistry in school, were an avid reader of Popular Science, or maybe a read the encyclopedia at least once in your life, you’d probably know that the blue colored flames are hotter than red flames, and/or are the result of sulphur(sulfur) gas combustion. 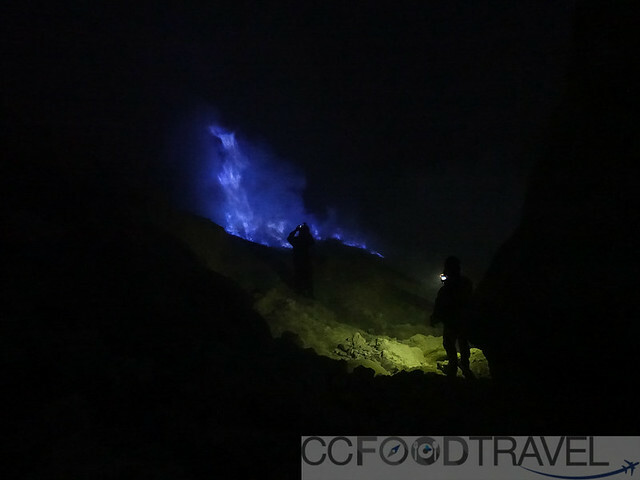 For Ijen Crater, the blue flames were the result of super hot sulphur gasses escaping from the deep recesses of earth then combusting on surface air. Besides sulfuric gasses escaping from the earth’s crust, hydrochloric acid penetrates the ground to contaminate the water on the crater to the level of 0.5 pH making a very acidic body of water on the Ijen caldera. The body of water happens to be the largest and most acidic mass of water in the world so don’t drop your gear in it or stroke the water with your bare hands. 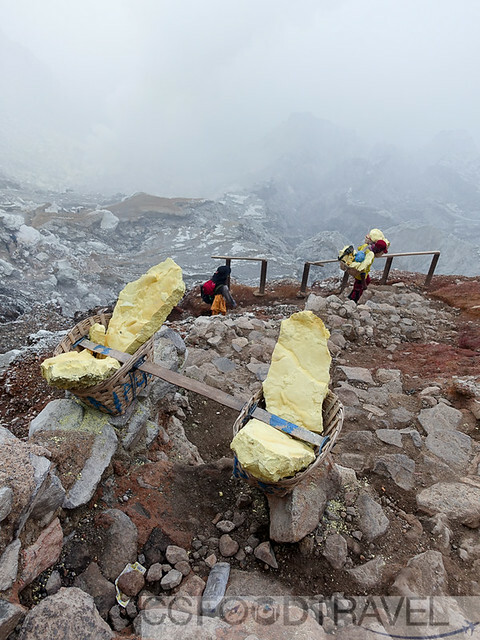 Sulfur miners average 2 trips a day from the bottom of the crater to the foot of the mountain carrying 70-90kg load which they dig up themselves. They make USD0.08 per kg. Not the easiest or the most lucrative job in the world. 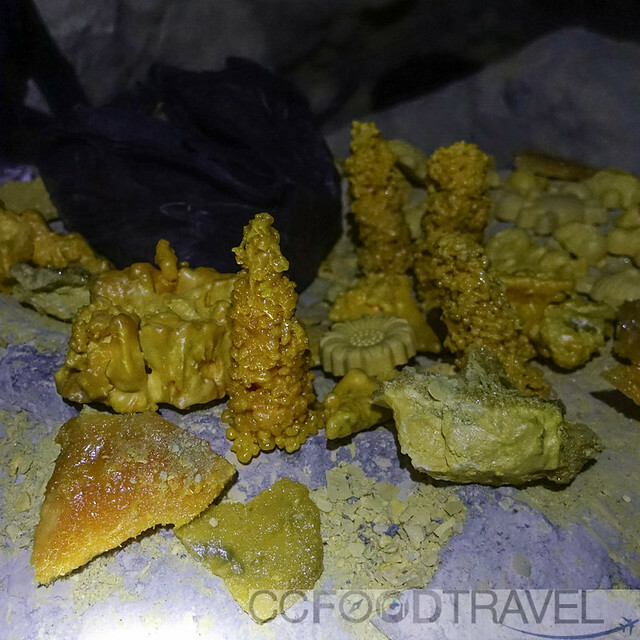 Miners sell natural sulfur formations and moulded sulfur sculptures to visitors to supplement their income. They also provide visitors an opportunity to try out their shoulder yoke with load for a fee. 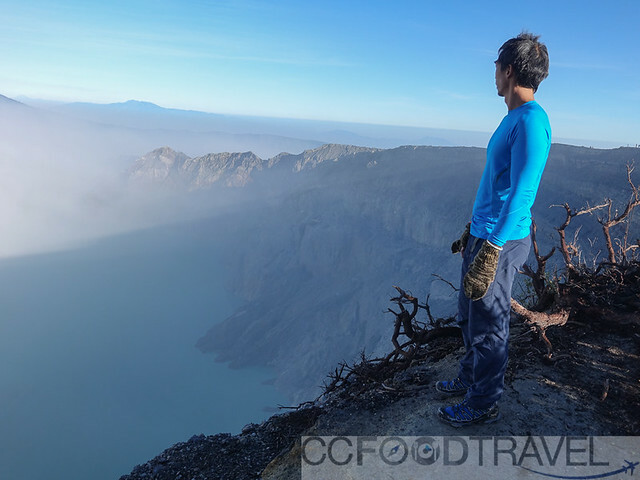 So is Ijen crater at 2799m easy to conquer? Yes it is. Anyone with a moderate fitness can easily attempt this attraction. It is only a 3-5km km hike from base camp, Paltuding, to the top of the crater – depending on whether you wish to walk to the end of the crater ridge. There are some steep sections but with some patience and perseverance, you can conquer them. The other challenge is overcoming altitude sickness and stinging sulfuric fumes. If you do not head down to the crater, the fumes will be manageable for most. 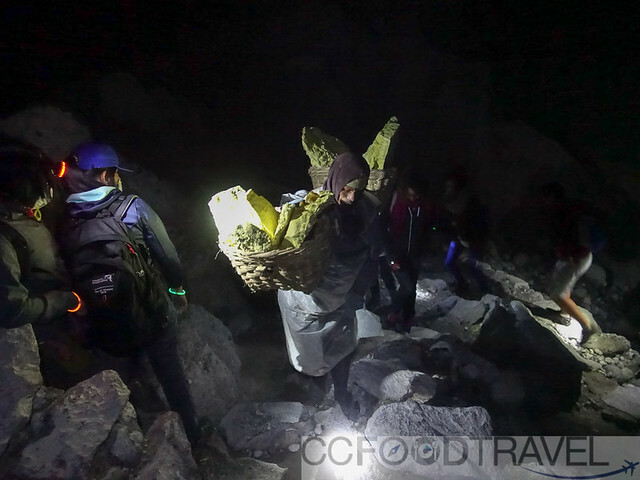 The hike down the steep rocky path takes a minimum of 20 minutes, depending if there is a crowd and if it’s in darkness. In day light, one can walk to the water’s edge. Do you need a guide to lead you up to Ijen? Unless you are a traveler who seeks plenty of information on a location or traveling with young children, a guide isn’t necessary. The path is easy to identify and difficult to stray off. 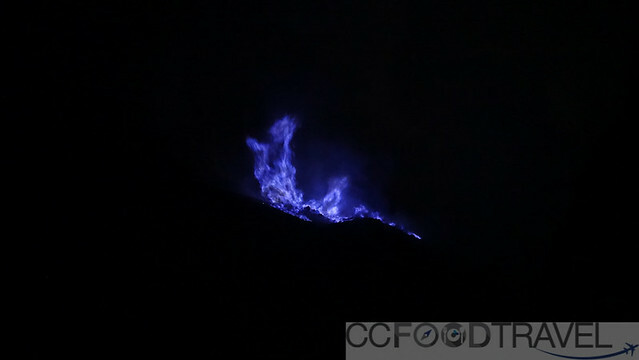 Blue sulfur flames are not visible during the day. It can only be seen in low-light or darkness so a midnight excursion is best because when you do the late night program, a beautiful sunrise is the bonus if the skies are clear. When day light breaks, one can capture an envious breathtaking Instagram shot at the end of the crater ridge. Ijen’s acid lake seen from crater ridge. Visitors can walk along the ridge to the right. Baluran National Park once harboured a diverse range of ecosystems in a 250-sq-km area of northeastern Java. Recently development has severely impacted the park, but it’s still a popular place to visit if ever you’re in Banyuwangi. Extensive grasslands still cover parts of the park, providing grazing for banteng (wild cattle), various deer and water buffalo, and the savannah-like terrain gives the place a feeling of adventure. Occupying the the remote Blambangan Peninsula on the southeastern tip of Java, Alas Purwo is well-known for its beaches, wildlife-spotting, savannah, mangrove and lowland monsoon forests. Apart from day-trippers and surfers, the park gets few visitors. Alas Purwo means First Forest in Javanese: according to legend, this is where the earth first emerged from the ocean. Many soul-searchers and mystics flock here during the month of Suro, which marks the Javanese New Year. These pilgrims meditate in caves and pray to Nyai Loro Kidul. Pura Giri Selokah, a Hindu temple in the park, also attracts pilgrims, especially during Pagerwesi, the Hindu New Year. The huge surf at Plengkung – aka G-Land is famous for its waves over shallow reef, and draw surfers here in peak season. Banyuwangi is famous for many natural phenomenons and one of them is the daunting Jagir Waterfall. Located in Dusun Kampung Anyar, Desa Taman Suruh, Kecamatan Glagah, Kabupaten Banyuwangi you will find Jagir Waterfall tucked in the center of it. The water that flows in this waterfall is from the source which is located in above the waterfall, Pawon Spring. To me, one of the nicest photo spots on this trip! Another interesting location we visited was Sg. Kalibendo. We walked around a private farm land converted for commercial tourism and ended up at this green lung. Lovely place for a weekend getaway in Banyuwangi. Kalibendo Banyuwangi also called Bendo river in English language, It is surrounded by plantations such as Coffee, Rubber and Cloves. This place is super fertile and located at the foot of Ijen Volcano. The journey from Banyuwangi to Bendo River Waterfall is 1 hour drive. 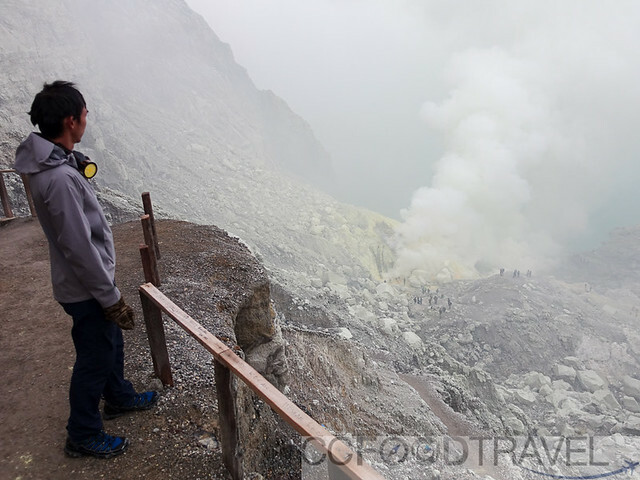 It is located in the northern city of Banyuwangi, in the same direction when we go to Kawah Ijen or Ijen crater. This place is a popular dating spot with the locals. The town is worth at least 2 days visit. You can cycle if you dare negotiate the busy traffic or just go on foot. We particularly enjoyed discovering and instagram-ming the colorful painted murals in residential lanes and riverside walls – there are so many of them! As for the foodie – don’t miss Banyuwangi culinary specialties of nasi tempong, rujak cingur and rujak cemplung. Shop at the local wet and dry markets in the town for local ware. Exploring the town, we ended up at the historical former British Army Headquarters where the remnants of a cast iron manhole cover showed where there was once a connection between Britain and the Australia telegraphic line. Coffee culture, alive and well in Banyuwangi! Robusta coffee thrives in the low highlands of Banyuwangi. We were told the unusual mix sulphur and sea conditions of the region add unique notes in the coffee beans. Find out yourself at local coffee houses when you visit and tell us what you think. Gourmet-ish coffee prices are amongst the cheapest in the world. We visited Ais Coffee for a locally brewed cuppa and whilst not the strongest, it certainly went down well on a lazy weekend.